Teddy bear hamsters are one of the most popular species of hamster. In order to keep your teddy bear hamster healthy, you need to feed it a healthy and balanced diet. 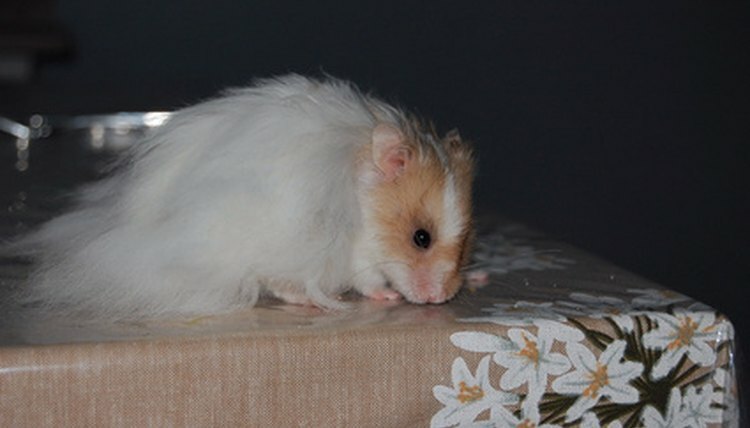 The name "teddy bear hamster" is a nickname applied to the Syrian hamster, also known as the golden hamster. Teddy bear hamsters are the most popular hamster species kept as pets and they generally have a lifespan of two to three years. These hamsters typically grow four to five inches long and should be kept alone in a cage lined with one to two inches of soft bedding. Like most hamsters, teddy bear hamsters are very active and should be provided with a hamster wheel so they can exercise. Your teddy bear hamster's menu should include a staple diet consisting of commercial hamster mix as well as some supplementary treats. Commercial hamster food mixes are formulated to meet the basic nutritional needs of hamsters -- they typically include a variety of seeds, grains and pellets. Keep a small bowl filled with fresh hamster mix in your hamster's cage and check it at least once a day. Teddy bear hamsters have a habit of stuffing their cheeks full of food and then hiding the food elsewhere, so you may need to refill the bowl occasionally. In addition to your hamster's staple diet of commercial hamster food mix, you should also offer your pet some fresh fruits and vegetables on a daily basis. Some of the best vegetables to offer hamsters include spinach, lettuce and carrots. Hamsters are likely to accept all kinds of fruit but they often show preference for apples and grapes. You can also offer your hamster a small amount of nuts, fresh grains and timothy hay as a special treat. Teddy bear hamsters are avid eaters so you need to be careful not to overfeed them or they may become obese. Follow the instructions on the package to determine how much of the commercial hamster mix to offer your hamster on a daily basis, and do not overdo it on supplementary foods. Only offer your hamster a small amount of fruit or vegetable each day, and clean up any uneaten portions of the food after a few hours in the cage so they do not rot. In addition to providing your hamster with food, you also need to make sure he has a constant supply of fresh water.